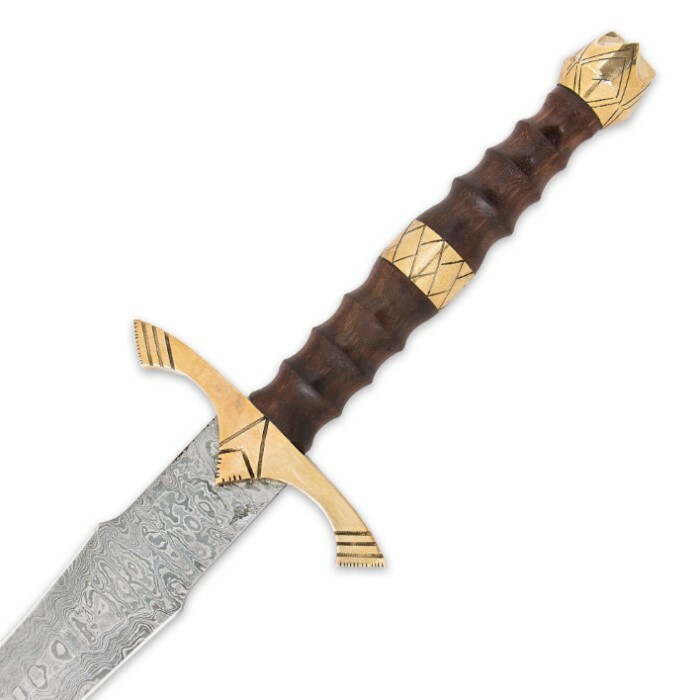 The Legends In Steel Heartwood Damascus Sword illustrates the grace of a Medieval weapon. Weapons like this were what shone light in that dark period of time. It features a 26" Damascus steel blade with its unique forging patterns and sharp edges on both sides. The handle is carved of beautiful heartwood with an elegant brass guard and pommel. A genuine leather scabbard houses the blade. 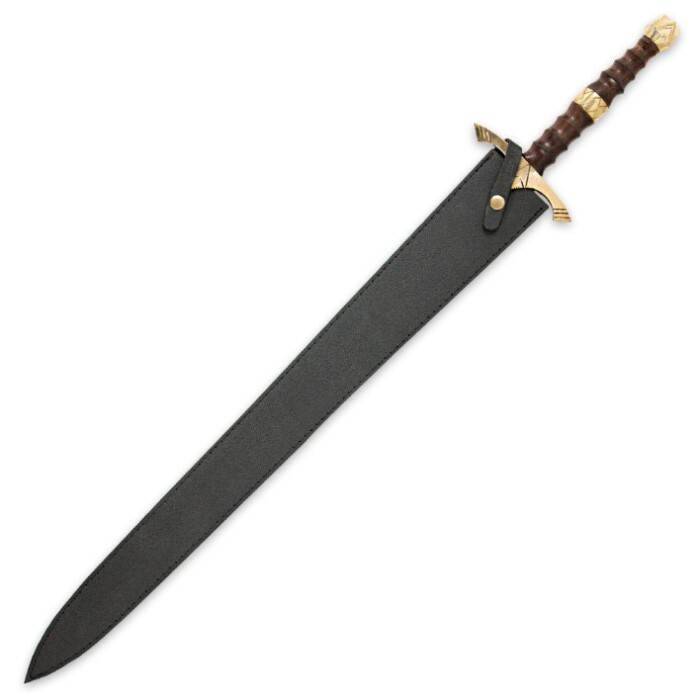 I ordered this sword on an impulse buy. I have bought a short sword from this site before, nothing special.. Great workmanship, incredibly sharp. So I decided to buy this sword. It showed up somewhat bent, which in my opinion.. Is great! It is truly a hand forged Damascus steel sword. The details in the blade are beautiful! I would recommend this sword to anyone! This Heartwood Damascus Sword is a very excellent broad sword, the blade was very well done, and razor sharp out of the box I believe this is a functional sword since it flew right through a gal. Milk bottle filled with water. The hilt was also very well done, a hand and a half handle, the brass fittings look great the guard is just the rite size and looks very nice, the brass collar on the handle was a nice touch, but the pommel is what stands out at least for me, it is practically four spikes of danger to any one stupid enough too try and take it from you. I recommend this beautiful sword to all, if you collect swords, wall hangers or not you must add this too your collection. Thank you BUDK. *Pros: Looks absolutely stunning, sharp, and the picture doesn't lie. *Cons: Sword came bent, sheath is a very tight fit and doesn't fit properly. *Both: This sword is made of higher grade steel (that is not stainless steel), in this sense it is good quality, but more care is required. Be aware that blade length is correct but they fail to mention that the handle, guard, and pommel are more like short sword size (Guard-5.5in, from guard to end of pommel-8in, width of sword-2in). 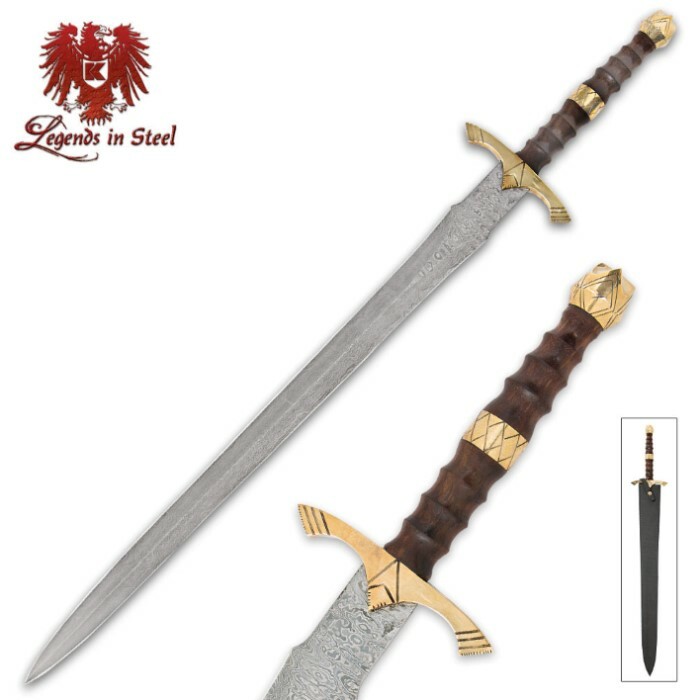 *All in all- its a good looking sword and pretty good quality, and for the sale price I got it for, ~$68( double sales are amazing), it was worth it. However, in my opinion the full price of $90 would not be worth the buy. Hope this helps. I just got the sword, the blade length is just what I expected, however the first thing I noticed when I opened this product was the unsymmetrical grinding all over the blade and the two blemishes on the blade. the balance is 3 inches from the guard. The edge does come a bit sharp so be careful opening it. I will give a more detailed review when I had a chance to weald it more. This is a great sword for the price. The blade is beautiful and relatively sharp out of the box, but I had 2 issues with it. First the "carved handle" was uncomfortable in the hand because the groove ridges were a little too sharp and where the guard meets the hand the edge of the brass was again a little too sharp. So I took a worn sanding belt and sanded down the ridges in the handle grooves so they were a little more rounded and then used an oil finish on it to make it look beautiful again. And then sanded the edge of the brass guard so it didn't cut into my hand so much. Now I absolutely love this sword. For less than 100 bucks, its not bad. The blade wobbles from side to side a bit in the handle, im gonna try dropping some washers down both sides of the blade to see if i cant sturdy it up. its sharp, but not razor sharp. still a neat sword. This sword has great balance. I cant tell if the handle is peened or threaded. None the less the handle is beautiful. The blade as i looked down it looked curved idk if it is from the forge process or shipping. Comes with a tip cover. Warning do not put sword in sheathe with pastic tip guard it will get stuck. It is sharpened. Seems decently sharp. Nice weight. Overall i love this sword.